GoldCrush is mad about hair. We believe that true hair-care is about more than just what new shampoo or hair oil you are using. We know that what you put in your body can be just as – if not more important, than products which are used topically. We love hair and beauty, that’s why we developed these special little capsules of golden sunshine (well, vitamin supplements really – but you get the picture), to help ladies on their hair-care journey. 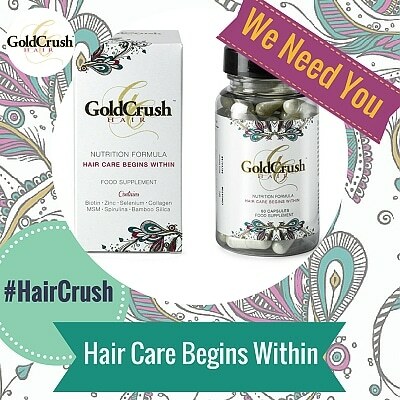 GoldCrush Hair Vitamins are specially formulated to help to boost the amount of nutrients in our bodies to feed your follicles, which in turn contributes to the maintenance of healthy hair. The fab thing about our capsules is that they not only help your tresses, but also help to maintain healthy skin and nails. A triple-threat for your daily regimen. Our formula’s active ingredients include: Biotin, MSM, Bamboo Silica, Selenium, Collagen and Spirulina. What sets us apart from our competitors is not what our vitamin does not contain – many high street and online Vitamin brands have bulking agents and fillers including Magnesium Stearate, Titanium Dioxide, Hydrogenated Oils and Colourants – these ingredients have a multitude of possible side effects including creating a suppressed immune system, blocking nutrients from entering the blood stream. GoldCrush has all the goodness without the nasty additions! As a social influencer, you’ll know already how important client testimonials, views and reviews are in creating a buzz around a product; but GoldCrush is not about making noise with no substance. We believe wholeheartedly in our product and are sure you will too. Your followers are on a continuous hair care and beauty journey and through your reviews are seeking validation and advice on the products that they should add to their bathroom cabinets! We have worked with some great bloggers/YouTubers to date and are the hunt for some more! There is also the opportunity to collaborate on a reader/social media giveaway!